Hi, I'm new in this forum and looking for a new Tokai LS 200 or LS 320. Does anyone know the main differences between these models. Have both nitro finish and a long tenon neck? Maybe I will buy from a japanese dealer. Any experiences or recmmandations? In ebay.de is a LS 150 for sale. I didn't find more informations about that modell. Does anybody know what it is? I will be grateful for your support. Hallo heba, Verst?rkung aus Hamburch, goil! Good question, because for the new LS200 it's not explicitely mentioned in the 2003-2004 catalog, only the LS120F and the LS320 have a "deep joint" neck. So to be absolutely sure you would have to ask the dealer to pull out the neck pickup. Nitro or rather "lacquer" finish is mentioned for all models from LS120F and above though. The LS200 is the only one that lists Heritage Dark Cherry / HDC as available color, the others only the standard CS and VF. On the other hand it's probably possible to order any Love Rock in another color, you will only have to wait longer if it's not in stock (which the LS320 never is anyhow). The LS200 has an ebony fretboard while the LS320 uses jacaranda (Brazilian rosewood) for that. And its maple top is classified "AAAA" while the LS200 is not further specified. The LS320 has Honduras mahogany for the neck and back, the LS200 description does not mention this. The LS320 (and the LS120F) has an aluminum tailpiece, the LS200 might not. It also uses CTS pots and oil condenser caps while this is not listed for the LS200. Last but not least the LS320 comes with Seymour Duncan Seth Lovers, the LS200 with Tokai/Gotoh PAF Vintage MK1 pickups. I've seen it, too, that's the "more4less" ebay shop which sold an LS150 for EUR 1,125.00 recently. Now it seems they have several LS150 models on stock, but I don't know if they come directly from Tokai Gakki or from music fairs. As far as specs go, you should reassure that his claims are really true like solid flamed maple top, one piece back etc. before you buy. Hi Heba, welcome to the Forum . There are all sorts of differences, as Han?s has summarised above ? take a look at the catalogues in the Registry section, eg http://www.tokairegistry.com/images/catalogs/tokai20010.jpg ). With the 320 I believe you can specify changes to the standard spec. Eg you can ask for your own personal preference for finish/colour (eg supply a photo & ask them to copy it, Tea Burst or whatever). I?d be a little wary though, because I know at least one unhappy owner who went to great trouble describing the exact colour he wanted, but after waiting almost a year for delivery he ended up with entirely the wrong colour/finish. Both LS200 & LS320 are of course pretty expensive guitars. You may care to see the range of comments & opinions recently delivered here re. interest & escalating prices on early Tokai models like Les Paul Reborn (several threads, try a search, or eg here http://www.tokaiforum.com/viewtopic.php?t=4008&postdays=0&postorder=asc&start=0 ). 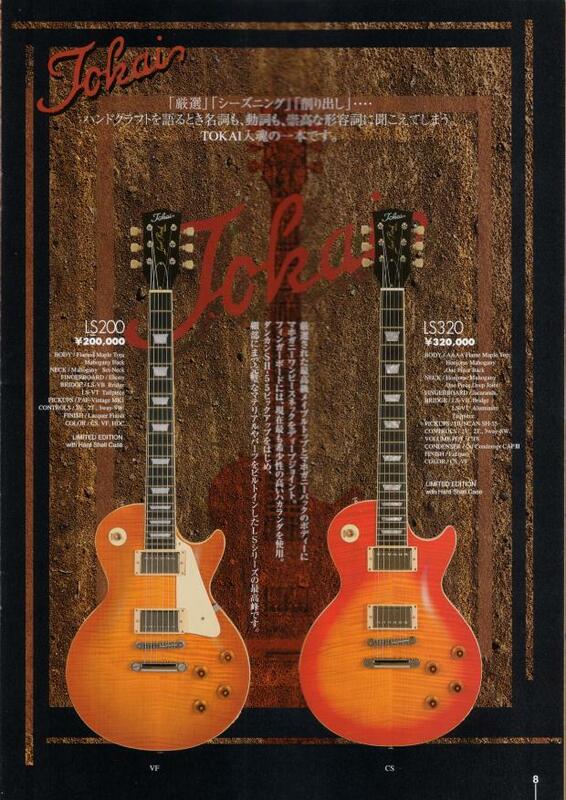 If you read those you?ll know my preference is for the older Tokai Reborns (or older Gibson, eg Norlin era Deluxe is fine by me). Just my 2Euro?s of course . In ebay.de is a LS 150 for sale. I didn't find more informations about that modell. Hi Heba, something seems strange with the auctions of this Ebay shop. I guess all Tokais have the UK spec. that means for example the headstocks are not 1:1 Japan spec. They've a dimple in the middle. Most of the pics are made to see not exactly even the headstock. He mentioned correct it is a MIK. But he is offering as a LS50Q. But this term is MIJ. Correct would it be ALS50Q. In his description features this model offers "solid quilted maple top". Correct is "quilted gravure print". Furthermore he described the neck and body made of mahagony. Correct is alder back and maple neck. Hello guys, thanks for your help. I got an offer from ishibashi for an LS-320. It's about 2100? incl. shipping. I have to add about 400? custom fee in Germany. Maybe it's a good price but I won't spend so much money for a guitar(I always spent a lot of money for my amps). So I will look for a used Tokai Reborn or Love Rock the next days. Maybe I find a nice and not too expensive example at ebay. Or is anybody in the forum, who is selling one? 256,000 Yen are ~1,900 EUR, so is the shipping EUR 200? I thought it was around 100 EUR... Anyhow, 16% VAT on 2,100 EUR are ~336 EUR on my PC. Maybe I find a nice and not too expensive example at ebay. Or is anybody in the forum, who is selling one? Did you see the 1982 LS50 that Chu71 just bought on eBay? http://cgi.ebay.ie/ws/eBayISAPI.dll?ViewItem&category=2384&item=7339548201&rd=1 ?very nice guitar at bargain price from reliable Japanese dealer (Japanoldguitar) ? that seller often has nice early Love Rocks circa.1980-83 around $500-$600 ? often has 1978-79 Reborns too, but expect to double the price on those (main difference is Les Paul name on headstock). Not trying to put you off brand new Love Rock ?LS200 & 320 certainly excellent guitars (ditto many Gibsons around same price), but considerable interest in ?vintage? guitars nowadays & quite right too because many of them have fine tone & pleasing vibe/character/age/wear ? Reborn maybe getting too pricey, but early Love Rock like Chu71?s LS50 offers relative bargain imho.